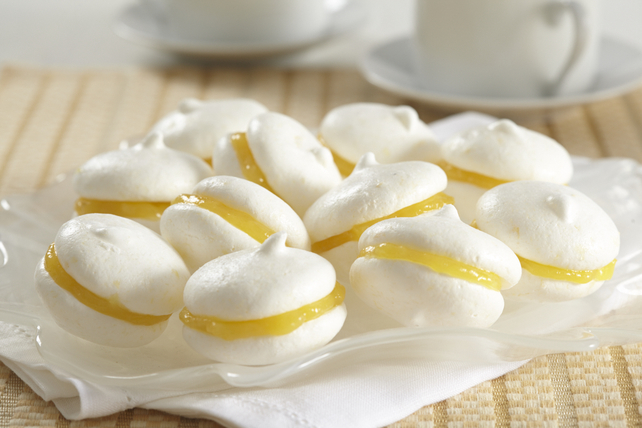 Add some delicious white chocolate to your lemon meringue cookies for a whole new taste. These White Chocolate-Lemon Meringue Cookies are a great treat that kids and adults alike will love. Cover 2 baking sheets with parchment. Draw 20 (1-3/4-inch) circles on each parchment sheet; turn parchment sheets over. Grate 1 oz. chocolate. Beat egg whites and cream of tartar in medium bowl with mixer on high speed until soft peaks form. Add sugar, 1 Tbsp. at a time, beating constantly until stiff peaks form. Fold in chocolate. Spoon egg white mixture into resealable plastic bag; cut 1/2-inch piece off one bottom corner of bag. Use circular motion to squeeze egg white mixture from bag over circles on parchment. Bake 45 min. Turn oven off. Let meringues stand in oven (with door closed) 10 min. Remove baking sheets from oven; cool meringues completely before removing from baking sheets. Meanwhile, microwave lemon curd and remaining chocolate in small microwaveable bowl on HIGH 15 sec. or until chocolate is completely melted and mixture is well blended when stirred. Cool. Spread bottoms of 20 cookies with lemon curd mixture; cover with remaining cookies, top sides up, to make sandwiches.